The annual Simulated Student Bid Competition hosted by the Construction Institute of Canada (TCIC) is in progress, testing students from across the country to tackle the bidding and estimating process. Half-sunken into the sea, ‘Under’ restaurant by Snøhetta, breaks the surface of the water to rest directly on the seabed 5 m (14 ft) below. 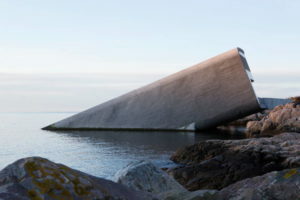 International architecture firm Snøhetta opened the doors to Europe’s first underwater restaurant named ‘Under’ in Lindesnes, Norway. In Norwegian, ‘under’ has the dual meaning of ‘below’ and ‘wonder’. Half-sunken into the sea, the building’s 34-m (112-ft) long monolithic form breaks the surface of the water to rest directly on the seabed 5 m (14 ft) below. The structure is designed to fully integrate into its marine environment over time, as the roughness of the concrete shell will function as an artificial reef, welcoming limpets and kelp to inhabit it. With the thick concrete walls lying against the craggy shoreline, it is built to withstand pressure and shock from the rugged sea conditions. Like a sunken periscope, the restaurant’s massive window offers a view of the seabed as it changes throughout the seasons and varying weather conditions. After arriving at the site, the visitors’ impressions of the unruly outdoors quickly dissolve as they are ushered through into the hushed, oak-clad foyer. The interiors create a warm, welcoming atmosphere inside. Textile-clad ceiling panels reference the colours of a sunset dropping into the ocean, accompanying one’s passage down the stairs. The finely woven ceiling panels lend a serene ambience to the building. At the seabed, 5 m below sea level, lays the panoramic eye of the building. An 11-m (36-ft) wide and 3.4-m (11-ft) tall horizontal window offers a visual gateway to the sea and connects the guests to the wildlife outside. According to the firm, an equally important part of the project is the building’s facilitation of marine research. The restaurant will welcome interdisciplinary teams studying marine biology and fish behaviour, through cameras and other measurement tools installed on and outside the façade of the restaurant. The goal of the research is to collect data that can be programmed into machine learning tools to monitor the population dynamics of key marine species on a regular basis, thereby creating new opportunities to improve official marine resource management.